B1G1 FREE Tei Pei Frozen Asian Entree Coupon! 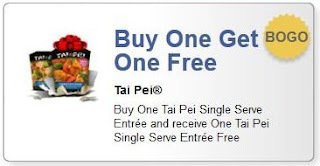 Hurry over to Tei Pei's Facebook page to score a B1G1 FREE coupon good on their single serve frozen entrees! These cost $2.18 at my Walmart, so only $1.09 each with coupon.